A choice of cutting bar to be used on a working table or as a stand alone cutting station. Significant cost and time saving in your daily finishing operations. Your soft and rigid materials can be cut quickly and safely. Cutting will be straight, accurate and uniform, which is impossible to achieve when using a ruler and a cutter. Cutting will be effortless, silent, dust free and maintenance free. A safe and fast return on your investment guaranteed ! 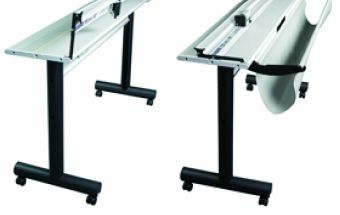 Stand alone work station for most of your wide format cutting operation. It can be adapted on an optional stand. Cutting precision of 1mm on the entire length.